Happy Mother’s Day! Here’s the bill. There is no corresponding “fatherhood wage penalty.” If anything, men appear to receive an income bump in response to having a child. It reflects, in part, these facts: women are more likely to leave their jobs, reduce their hours, or take on more flexible or less-intensive (and thus lower paid) positions in response to having a child. But a large portion of the penalty is unexplained by job experience and seniority, implying employer discrimination or impacts of motherhood on productivity. What is the “penalty” in the wage penalty for moms? The impact on a mother’s wages at a single point in time, relative to a similar woman who did not have a child. Defined this way, the penalty is about 5 percent of wages per child. The absolute loss of lifetime earnings as a result of having a child. The way parenthood deferentially affects spouses’ wages; in other words, the gender wage gap within specific heterosexual couples. How to minimize the motherhood penalty? It depends. Understanding the penalty through each of these lenses can help inform policy and individual decisions about when and under what circumstances one should have a child. However, it is important to be clear about which “penalty” a study is estimating. One question that many young women may ask, for example, is: what is the optimal age for becoming a new mother, if you want to minimize the impact of having a child on your earnings? The answer from the literature is…it depends. Are you trying to maximize your lifetime earnings, or close the pay gap with your spouse? Depending on your goals, the research might lead you to vastly different conclusions. So, if you’re concerned about reducing wage inequality within your (heterosexual) marriage, it’s better to have a child very early or a bit later in your career. But, perhaps you are less concerned about your income relative to your spouse than maximizing your lifetime earnings in absolute terms. In this case, you should avoid motherhood in your early 20s, especially if you are highly skilled. For women scoring in the top third of AFQT scores, waiting to have children until their 30s could reduce the lifetime motherhood penalty by more than one third, according to research by Elizabeth Ty Wilde, Lily Batchelder and David T. Ellwood. 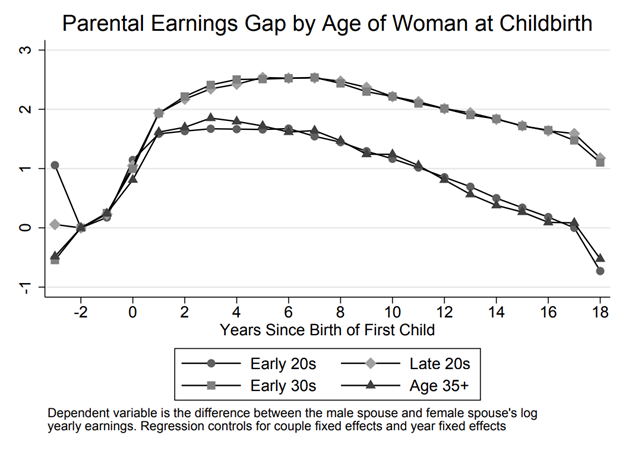 This is because the earnings hit resulting from motherhood is particularly consequential early in one’s career, when earnings are usually rising faster. Other studies draw similar conclusions: young mothers experience a larger earnings hit (relative to not having children) than those who wait to have children. So, if you want to reduce the impact of having children on your lifetime earnings, it might be best to wait. On the other hand, if your primary concern is wage equity with your spouse and you simply can’t wait until your mid-30s to become a mother, you might choose to go ahead and have a child before you’ve really established yourself in your career. Of course, timing pregnancies precisely is sometimes difficult, but the use of the most effective forms of contraception, especially LARCs, makes it much more possible. Regardless of how these studies define “penalty,” the major conclusion is overwhelming: motherhood will cost you. For women, having a child interferes with the accumulation of human capital, and thus leads to lower incomes. This reflects the strongly gendered division of labor when it comes to child rearing. Mothers might cut back on working hours or education, choose more flexible (and lower-paid) positions, or drop out of the labor force entirely to confront their parenting responsibilities. At the same time, employers may discriminate against working mothers, who are perceived as less competent or committed to their jobs than men or women without children, and are thus penalized in the labor market through lower pay and less likelihood for advancement. Is there a role for policy here? Given the extremely high costs associated with raising children, and the fact that women bear the brunt of childcare responsibilities, subsidizing the costs of childcare through the tax system could help. So too could paid parental leave which should encourage parents, and mothers in particular, to remain attached to the labor force while they take time away from work to care for new children. Cultural explanations related to gender norms and employer discrimination will be trickier to tackle, but family-friendly policies such as these can help nudge norms. Mothers make huge sacrifices for their children. Perhaps the best thanks we can give them this Mother’s Day is to work towards reducing the sacrifices they make in terms of wages, too.